Last summer, I ran a picture book manuscript past my critique group. It was ready to go. I just wanted their stamp of approval and then I could send it off. The problem was that I didn’t get it – the stamp of approval. It seems that in the process of rewriting my work, I hadn’t smoothed out bumps and made it tighter, but instead had lost my focus. The telltale sign that this had happened was the chorus, or actually two choruses (chori?). In picture books, there is often a repeating line of text that echoes throughout the story, much like a chorus. You don’t see it after every page turn, but you see it often enough that readers learn what is coming when they hear the first two or three words. In the first draft of my story, I had created a chorus based on my theme of the story. It worked because it made the story cohesive. But then I had to strengthen the character. While I was doing that, I started to play here and there with the text and another chorus emerged. In a longer book, this might work but mine comes in at less than 500 words. Nope. No room for a second chorus. With it, the story felt unwieldy. The only solution was to rewrite it and get it back on track. It was going to be tough to evaluate each spread for what could and couldn’t stay in the leaner meaner version. I needed something to keep me on track and help me focus. Fortunately, I remembered the three sentence pitches we practiced writing at a Missouri SCBWI writing retreat. A three sentence pitch is just enough to give an agent or editor an idea what your story is about. It deals more with theme and character than plot. With only three sentences about your story, you have to focus if you are going to fit your character, her problem and a hint at the theme all in three sentences. No one knows what’s going on at Sappington’s Superior Circus better than Felicity Fernandez. She finds lost children and car keys and can point the way to the next act. The problem comes when she can’t find her place in the Circus and she wonders if she would be better off someplace else. In 53 words, I have the character (Felicity Fernandez), the setting (Sappington’s Superior Circus), the story problem (Felicity can’t find herself), and a hint at the theme (even if you know where everything else belongs, it may take some time to find your place). 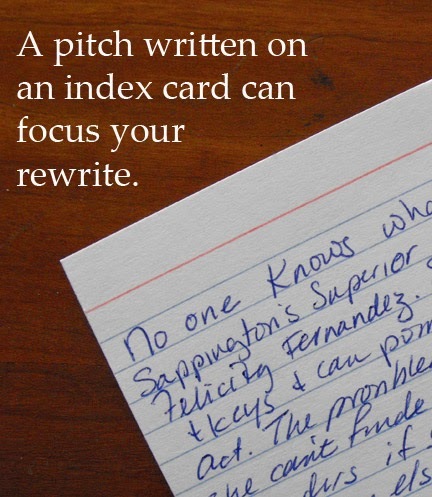 With this in mind, and on an index card, I can evaluate each paragraph of text. Does it develop this idea? If not, cross it out. When I am done, I will have a tightly focused story with a chorus that once again has the space to ring out. SueBE blogs about writing at One Writer's Journey. Sue--Using that 3-sentence spiel is a wonderful technique to keep your manuscript on track. Thanks, Sue. I think we all need to be reminded to focus from time to time, and getting a story down to three sentences will certainly do it! This is a very helpful exercise. :) I have even heard of trying to do it in one sentence. One time I heard if you can't tell what your book is about in one sentence, then you don't know what your book is about. . .Seems harsh, but I think it means like you said, sometimes we are all over the place or trying to do too much. Thanks for the example, too! We wrote one sentence pitches at a critique. For something like this, I don't want to spend that long honing and condensing, not when I need to be rewriting. BUT one sentence comes in very handy when I need to write the query letter! Sue, This is a great exercise. I can even see how to incorporate it into journalism - especially when my students are developing stories! I appreciate this glimpse into the world of writing children's books-- it's a an idea that carries well into other realms. Thank you.